If I was reminded of anything last week, it was this: that I have amazing, wonderful, supportive friends, and that my family loves me. 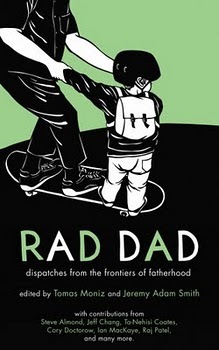 Last week, I had two readings to support Rad Dad, the parenting anthology in which I have a piece, one in my children’s hometown, Bakersfield, and one in my childhood hometown, LA. And at each one I was overwhelmed with gratitude to see the faces of the friends and loved ones who turned out to support me, who came out because of me. In Bakersfield, the crowd was filled with my daughters’ best friends and their parents, our community, our lifeline, our real-life social network, our family by choice. 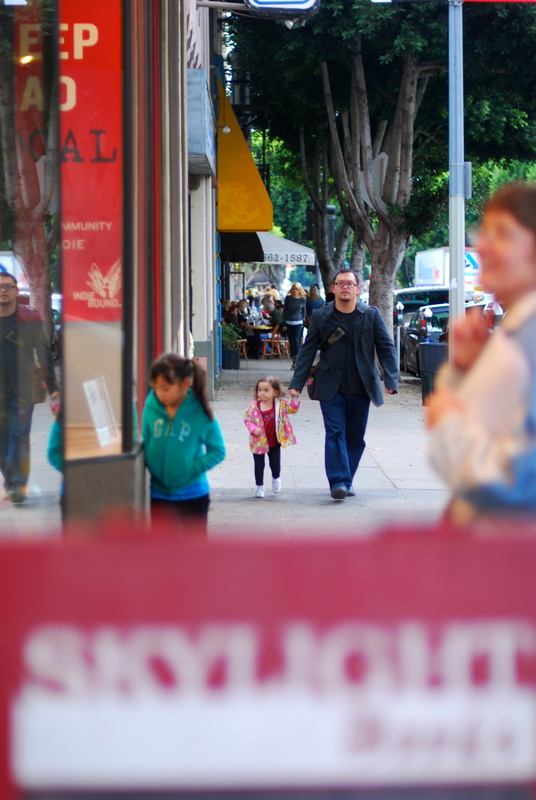 In LA, my parents and my calabash uncle and aunt shared the atrium of my old neighborhood bookstore with an amazing array of friends, from people I went to junior high school with over two decades ago to friends I’ve talked to for years thanks to the internet but hadn’t gotten to meet in person until that night. And of course, as always, there were my three muses, my loves, my reasons for doing what I’m doing and writing about it after, without whom I wouldn’t have been there in the first place. 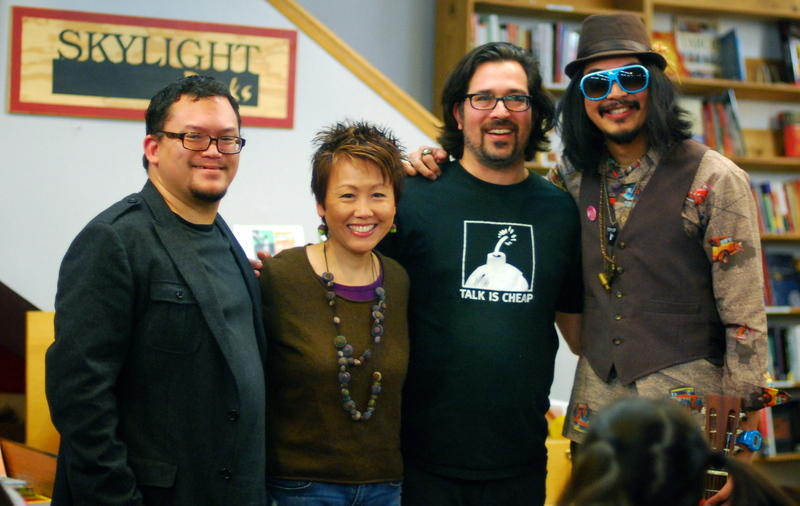 I was honored to share the floor and the mic with Tomás Moniz, who writes eloquently and passionately (and often hilariously) about the challenges, obligations and joys of fatherhood, with Lisa Yee, whose written words so excite my daughter and whose books peopled by people like me remind me of why I wanted to be a writer in the second grade, and by C.J. Pizarro, a.k.a. Mista Cookie Jar, who creates music parents and children want to dance to together, and so, so happy to share that far-flung community made physically manifest for one brief night by bonds of friendship, support, and understanding. This entry was posted in Uncategorized and tagged community, family, fatherhood, friendship, gratitude, Lisa Yee, Mista Cookie Jar, nablopomo, nablopomo day 13, Rad Dad, Skylight Books, Tomas Moniz. Bookmark the permalink. You’re exactly where you should be, Jas – fathering, writing, and making a difference. I had a wonderful time — thank you for allowing me to be a Rad Dad for the night!